Sometimes a picture just says it all. 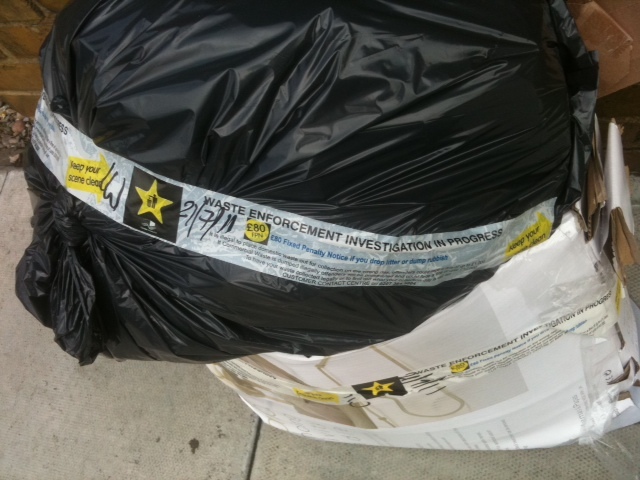 This bin-bag is marked, “Waste enforcement investigation in progress” and has been slapped with an £80 fine. It is outside an end-of-terrace house in Deal Street, Spitalfields. Yes, Mayor Lutfur Rahman, the man responsible for wasting taxpayers’ cash on iPhones, Mercs and very plush offices. He rents it out (see his register of interests via this link), but according to neighbours, he doesn’t seem to have been the most active of landlords – because his current tenants appear to have been leaving the area like a tip. “The property has a small garden at the front next to the pavement. 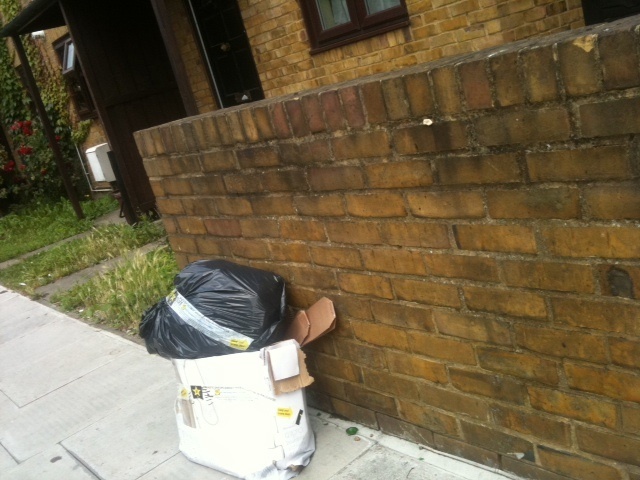 Neighbours keep their front gardens tidy and use Tower Hamlets Council bins and bags for refuse and waste food collection. “The Mayor’s tenant has persisted in throwing unsealed bags of refuse and food into the front garden which is then not collected by the council. The rubbish invariably gets blown into neighbouring gardens and attracts vermin and flies. “They also dump waste on the pavement outside, which usually spills across the road and is a menace to pedestrians. There’s a school opposite. The question is why won’t the Mayor be a good neighbour and a responsible landlord by ensuring his tenant follows the council’s domestic waste disposal rules? When is he going to get his house in order? I am saddened, in response to the letter from Garry Wykes, by the attitude of some people towards dropping litter (“Younger generation often guilty of littering our street”, Advertiser, July 14). through the fixed penalty notices for litter as well as clearing problem areas with organised litter picking through our volunteering coordinator. We have recently launched the ‘Find it–Fix it’ scheme which will sort out problems, whether on council or private land. We are also looking to work with schools to develop antilittering messages so that the younger generation can be taught not to litter. All of this work is in vain if we do not all take responsibility for keeping the East End litter free. The eyes of the world will be on us next summer with the 2012 Olympics. I want visitors to remember Tower Hamlets as a place to visit—not the litter on its streets.